On June 10, the Boston Islamic Seminary (BIS) will feature a program titled "Unlocking Your Potential With Suzy Ismail and Imam Siraj Wahhaj" at $35 a ticket. Who are these speakers and what does their presence reveal about this new Seminary? Wahhaj's name is very familiar to observers of the Islamist lecture circuit. For decades Wahhaj has been a regular speaker at events put on by the Council on American Islamic Relations (CAIR), the Muslim American Society (MAS), and the Islamic Circle of North America (ICNA). His long record of anti-gay, misogynist, anti-Western, and racist remarks are available for any to hear. I still remember the first time I heard Imam Siraj Wahhaj speak. 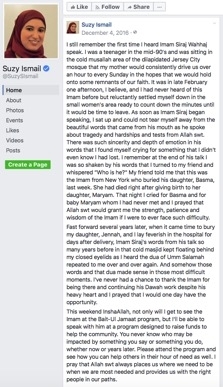 I was a teenager in the mid-90's... As soon as Imam Siraj began speaking, I sat up and could not tear myself away from the beautiful words that came from his mouth as he spoke about tragedy and hardships and tests from Allah swt. There was such sincerity and depth of emotion in his words that I found myself crying for something that I didn't even know I had lost. I remember at the end of his talk I was so shaken by his words." Ismail has more intimate connections to propagators of extremist forms of Islam. Her four books – on Muslim marriage, divorce, Muslims in the workplace, and a children's story – were published by Amana Publications. Among the most prominent titles of this Muslim publishing house is Reliance of the Traveller: A Classic Manual of Islamic Sacred Law, translated by Nuh Ha Mim Keller. This 13th century text lays out the laws on everything from keeping concubines to praying properly to when to wage Jihad. Inside it features a certification from the Islamist think the International Institute of Islamic Thought (IIIT) affirming the high quality of its translation. The Boston Islamic Seminary is the latest project from the the Islamic Society of Boston (ISB), whose founding trustees have included Yusuf Al Qaradawi, the spiritual leader of the Muslim Brotherhood, and Abdulrahman Alamoudi, an Al Qaeda operative who was jailed in 2004 for conspiring with the Libyan regime to assassinate a Saudi Crown Prince. Twelve of the ISB's congregants, supporters, staff and donors have been imprisoned, deported, killed or are on the run -- all in relation to terrorism offenses. The ISB's officials, clerics and guest speakers have promoted anti-Semitism, misogyny and apologism for terror. A comprehensive report into the ISB, published by Americans for Peace and Tolerance, can be read here. The Boston Islamic Seminary's faculty members include Suheil Laher, a Salafist cleric who formerly served as head of a Boston-based Al Qaeda charity named CARE International. Laher's personal website previously featured attacks on Jews, Christians, and kuffar (non-believers); cited al-Qaeda leader Abdullah Azzam's infamous call to jihad; and linked to an al-Qaeda fundraising website.